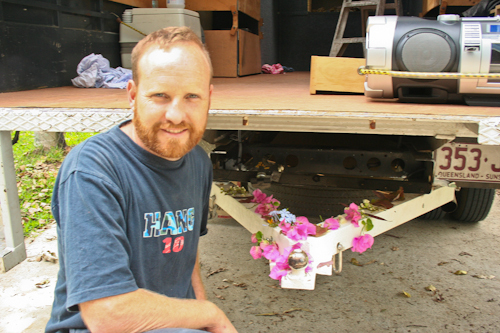 We arrived home again on Sunday, and our primary business is to modify the trailer so we can use it properly on an even longer trip around Australia! And although the girls were once again back with their houseful of toys, they too kept wanting to stay close to the truck and trailer. 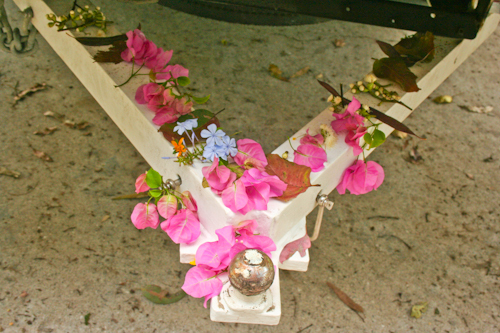 They returned again and again to play in it, and when David came back from buying some building supplies, he found that Aisha had arranged a beautiful assortment of flowers on the new tow bar that he built from scratch and that pulled our trailer on our last trip! Aisha was so excited to call David down to the truck to show him her handiwork. 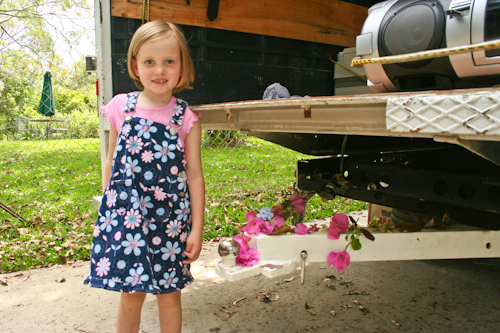 One of the blessings that comes from having daughters, I guess — your truck gets decorated with flowers! David and I wanted to use this trip to work out how best to fit out “the trailer:http://www.sparklingadventures.com/index.php?id=1107 based on how we’ve been living when we’re off-grid — i.e. not parked outside a friend’s house. Our truck’s auxiliary power is enough for three days, which isn’t much for a long stationery camp. (It charges as soon as we start driving the truck again.) So we’ll supplement this power with more batteries in the trailer. We think we’ll build beds in the trailer after first insulating it completely. And we’ll turn the side with the lift-up door into a kitchen area with its own water supply. This means we’ll have twice as much water on board and will use the truck’s sink primarily for washing hands and brushing our teeth. During our last trip, Misty the dog has been an excellent travelling companion. She sticks close to camp and follows us when we go for walk. Slowly she’s also slowly turning vegetarian as she eats our left-overs (like pumpkin soup). I know that we’ll need to get someone to look after her when we go to New Zealand, and I’m hoping we can rent her out with the house. Another daydream is that while we’re on the road, someone nice will become so enamoured with her that they’ll beg us to let her stay. If we can park out the front of your place during our travels, please let me know!